For the life of me I cannot tell the difference from a JB80 and a JB120. I see the neck inside says 120A. From what I see JB120s have a brass nut this one has a white (bone or plastic nut). Maybe it was just redone at some point. Also, how do you tell the difference with Brazilian rosewood and regular rosewood from looking at a picture? Pictures can be very deceiving. Can anyone here read Japanese and can translate the JB80 and JB120 text? Maybe that would shine more light on the situation. I read other posts here saying the JB120 has 1 piece sen ash. Other older Reverb posts state the 120 as Alder. The current listing says 2 piece alder. Anyways, is this the real deal or is this guy pulling one over? Looking at my 1983 spec sheet, the only difference between a JB80 & 120 is possibly the body wood. On the 120, the body could be made of 'Castor Arabia' (Sen), Linden or Alder. The JB80 says it's only made of Alder. Everything else seems the same. By the way, Sen is not Ash, it's a different wood. Looks a nice bass, though. IMO the fingerboard looks like typical rosewood; even has a bit of Macassar Ebony look to it. If it were Brazilian from the production era it would most likely have some fairly spectacular grain attributes. I was actually looking for a alder body J bass with a rosewood fretboard and a nitro finish. I was not looking for a 120 but this listing had the same specs I was looking for. I have several Jass basses already Ash, alder etc. I was originally thinking of ordering a custom J bass from Tokai with these specs and three layers of SEB in alder. I have ordered a few brand new Tokais and they are top notch. I also own several late 70's early 80's ones that are top notch also. Yes, I have a feeling the seller is lying about something. Maybe this is a 120 neck with a Fender Squire body or maybe it is the 120 body I really have no idea. I asked him about the brass nut (which the 120 should originally have) and he said it had the white nut when he got it. Is he lying to me maybe. Did he stamp a 120A on a JB45 neck maybe. I really have no idea. I did notice a bit more grain in Brazilian rosewood pictures I looked up on the internet vs this neck. So, I really do not know about that one. I can sort of see that it looks like Brazilian rosewood and I can also see it looks like regular rosewood. The 81 catalogue I found (better res. 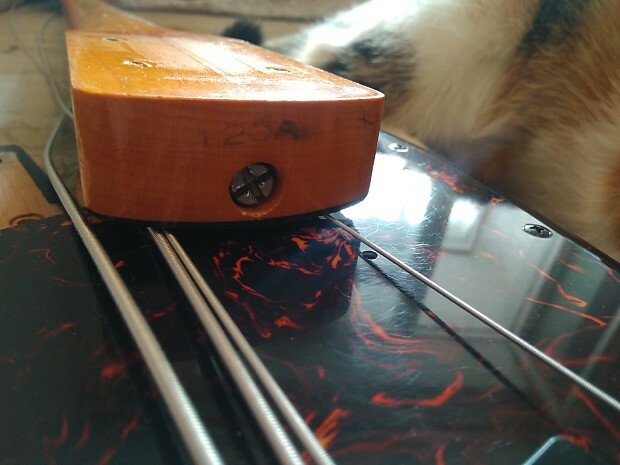 than the one on here, so I could read it) lists the 120 as having a jacaranda fingerboard, while the 80 has rosewood (how to tell the difference?). The 120 has a 1 piece sen (i.e., ash) body, while the 80 has alder (again, how can you tell?). Not saying that page is correct or anything it was just all I could find last night about the 120. Any seller worth their salt should point out any & all desirable attributes, and offer support for their claims, if it is not obvious to a casual observer. Any potential buyer could have any range of knowledge of any item, or no knowledge: It is up to the seller to make the case why any prospective buyer should buy any item. Buyer beware; do your own due diligence. EDIT: one other thing = when I sell Fender style guitars, or bases, Tokais specifically, I offer photos of the neck heel, the body neck route, and the control routes. If a seller does these things they can potentially offer a prospective buyer more information, and less confusion. Are you sure the JB120 came with a brass nut? Even the catalogue looks like a white nut. PS the brass nut may also be original. I think I read it somewhere else yesterday also. Then these two old reverb listings both have brass nuts. So, I think that was stock since I found three different things about the brass nut. I could be wrong though. Just a hunch. Actually, I just looked at those listing again. There are both the same bass. Just one with a pick guard and one without. Looks the guy who bought it for $700 in 2015 sold it for $1440 in 2016. Minus the SH costs. I guess that weakens my theory about the brass nut being original. Anyone know the difference between the early 80's jazz basses? Like what is the difference from a jb45 to a jb 50, 60, 80 120 etc? Do only the 80 and 120 have a nitro finish?